Have you ever been wrong about something for 43 years? I have. I thought I knew everything there was to know about the KISS visit to Cadillac in 1975. After all, I orchestrated the visit and event. I have always been the ultimate source of all things KISS Cadillac. Until I wasn't. Now, I could be stubborn and refuse to admit my own cluelessness, except my stupidity has revealed yet another facinating facet of the never ending story of KISS Cadillac. The legend continues to grow and who am I to stand in its way? I'm already old, short and bald, so adding “doofus” to the list is no biggie. Some background is in order. After the KISS visit in 1975, newspapers and magazines all over the world printed articles about the event. I was the Cadillac High Cadillacan newspaper advisor and our student staff collected these. Later that spring, May 1976, we put together a “KISS Memory Scrapbook” – 12 pages of articles and photos. Back then, this was a laborious process. There was no digital, no computers, no electronics, nothing like that. Everything was done on typewriters and cut-paste by hand. Once the layout was done, the paper was delivered to the printer and they did their typesetting and printing. The turnover time was measured in days (if not weeks) and certainly not overnight. Photos were even more difficult. Film had to be developed and that usually meant sending negatives to a lab downstate. Again, digital was not invented yet. As the years went by, I have insisted that there was no Cadillacan KISS edition other than the May 20, 1976 KISS Memory Scrapbook. From time to time photos would surface showing a member of KISS holding a Cadillacan at the civic breakfast which took place on the early morning of October 10, 1975. Since the concert was on the evening of October 9, there was no way the Cadillacan (not produced until months later) could have been at that breakfast, right? I labeled these photos as fake. Here's where things get sticky. 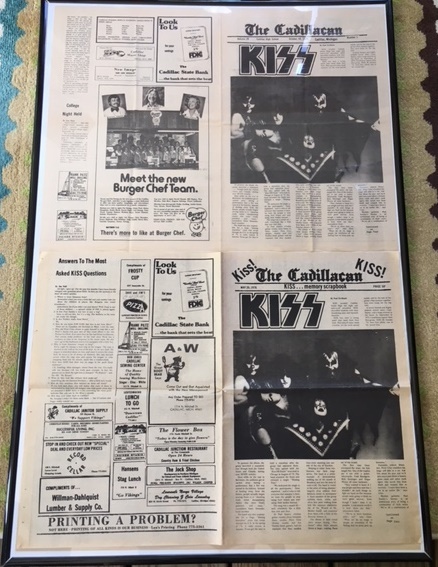 Recently, KISS collectors Rich Edwards of Manton and Matt Agnew of DeWitt approached me with the possibility that there was a Cadillacan with a date of October 10, 1975. Not only that, this edition did appear at the civic breakfast. They offered photographic proof. They enlisted Scott Davis, designer of a book titled “Magic – KISS Kronicles 1973-1983” to add further proof (https://www.facebook.com/MAGICKISSKronicles1973to1983/). However, I still had my doubts. How could this be? I had never seen one of these. I was the newspaper advisor, so how could this edition been produced without my knowledge? I wracked my brain and truthfully could come up with no recollection of an October 10 Cadillacan. Rich Edwards has a copy of the October 10 and I have a copy of the Memory Scrapbook, so we met and compared the two editions. Here is what we found. First of all, the 10 edition is just 4 pages. The only KISS article is the front page. The inside two pages have nothing to do with KISS. The MS edition has 12 pages and contains articles reprinted from magazines and newspapers from around the country. That front page article in the 10 edition only mentions the concert the previous night in the first paragraph and the rest of the article has no further mention of the concert. The rest is just background information about the group. This was obviously written beforehand. It looks like the KISS article was put on the front of a regular Cadillacan issue. There are two keys, however, that Rich and I agreed make the 10 issue legitimate. The newsprint is the same poor quality in both editions. The Cadillacans were done on the cheap, so using flimsy paper made sense. This is why yellowing has happened in these issues. Rich, Matt, and Scott for adding this to the KISS Cadillac legend. It does not end here, though. There is still a mystery to be solved. Unfortunately, student editor Paul Kwilinski passed away. The printer of the Cadillacan in 1975 (Lou's Printing) no longer exists. Hopefully, local CHS alumni, KISS fans, and the KISS Army can provide the answers to some questions. It took 20 years for Rich Edwards to find an October 10 edition (and he has only found a few since). We wonder how many of these were actually printed. Was it just a few slapped together for that day or were there enough for all the students? How many October 10s are still out there? We wonder if some still exist and in what condition. The scarcity would seem to indicate only a few. If so, what are they worth on the collector's market? I have put all the photographic evidence and some additional commentary on my personal KISS Cadillac website at: https://www.neffcadillackiss.com/mystery. If you have a comment or information to share, there's a form on the page you can fill out and zap to me. This is a KISS Cadillac mystery that has yet to be solved. With your help another piece will be added to the remarkable saga that is KISS Cadillac. Jim Neff is a local columnist. Read Neff Zone articles online at CadillacNews.com and NeffZone.com/cadillacnews. The two Cadillacans -- October 10, 1975 (top) and May 20, 1976 (bottom). For more photos and commentary go to: https://www.neffcadillackiss.com/mystery.